As of R3 2016 RadPivotGrid provides the option to select multiple or individual cells, rows and columns using the mouse. By default the selection functionality is disabled and to turn it on you have to set AllowSelection property of the PivotGrid to true as in Example 1. Additionally, you will be able to select separate blocks of cells by pressing Ctrl key or extend the current selection by pressing Shift key. Clicking on any of the headers will select the corresponding row/column as shown in the next figures. 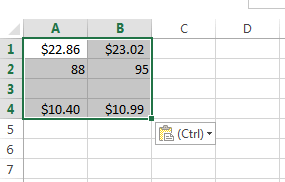 CopySelection – used to copy the selected cells data into the clipboard. ClearSelection – clears the current selection. Example 2 demonstrates how you could use CopySelection and ClearSelection commands together with a button. After copying the selected cells, you could easily get that data from the clipboard with code as shown in Example 3. Figure 5 shows the result after copying certain cells selection. You could also directly paste the clipboard data into Excel, for example, as illustrated in Figure 6. SelectionChanged - this event occurs when the current selection of RadPivotGrid has changed. The passed event argument is of type System.EventArgs. Any changes in the appearance of the selection overlay should be made inside the SelectionOverlayStyle. Example 4 shows the SelectionOverlayStyle with the provided properties. SelectionFill/SelectionStroke/SelectionStrokeThickness and SelectionPadding properties refer to the whole selection blocks, while the SelectionCell properties refer to the current selection cell. You could easily disable marking the current selection cell by setting DrawSelectionCell to False as in Example 5. Figure 7 shows how the selection looks before and after applying the Style from Example 5.